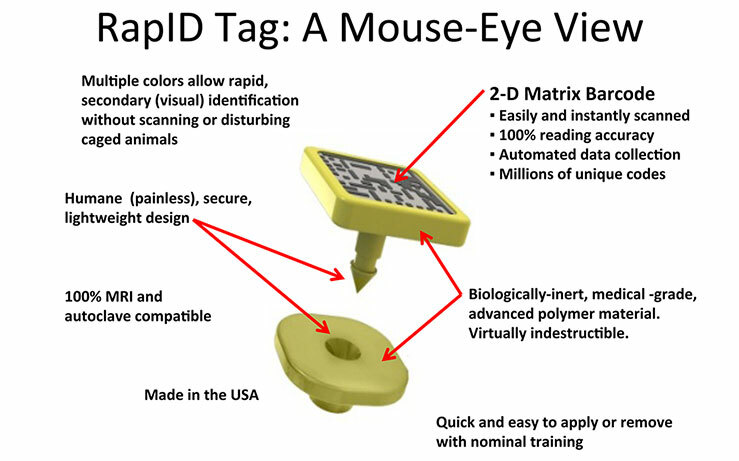 RapID Tags are the newest, most humane, miniature automated mouse ear tags available. 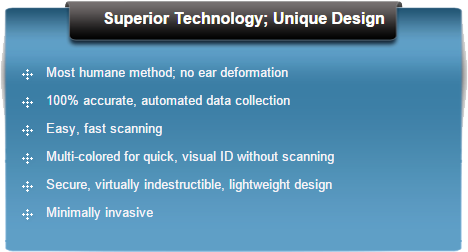 Their unique design and superior technology make them the most cost-effective, automated lab animal identification on the market. The hardened 2-D barcode allows for immediate scanning, providing fast identification with 100% accuracy. They are capable of providing millions of unique IDs, their multiple colors allow immediate secondary (visual) identification without scanning, they are MRI and autoclave compatible, and are minimally invasive (no surgery required, like most mouse RFID chips). In addition, they are lightweight, more durable than other similar lab tags, and can be applied quickly with only minimal training. 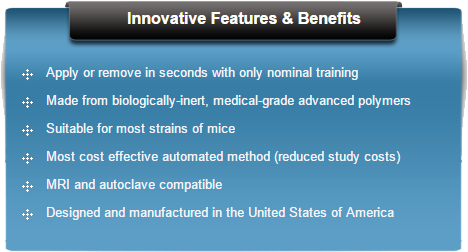 The benefits of RapID Tags inside any research and laboratory facility are unmatched. The sleek barcode automation eliminates animal identification errors and provides the easiest and fastest method for data collection. Furthermore, this methodology is compatible with study and colony management software as well as spreadsheet applications. RapID Tags have been industry tested to confirm their performance, tolerability, and durability. To top it off, they are completely an American product, designed and manufactured in the USA. Manual ID systems are subject to identification errors. These errors can lead to a host of negative outcomes. Administering the wrong treatments, collecting the wrong measurements, and compromising study data integrity are just a few of the possibilities. The inefficiency of Manual ID systems also results in increased costs. Compromised study data, time spent deciphering and re-measuring, and the need for more lab animals per test group all contribute to wasting your money. Compared to using a Manual ID system, our animal identification tags provide numerous benefits. Automated barcode scanning of each lab tag is fast and hands-free. It is 100% accurate. It eliminates the need to interpret IDs and allows visual identification without scanning thanks to the multi-colored tags. These factors come together to optimize data collection time. It makes the job easier, and more cost-effective. RapID Tags are a much better value, costing a fraction of mouse RFID chips. Additionally, our animal tags use ubiquitous laboratory light scanners instead of costly, custom, RF transmitters and receivers. These mouse ear tags do not require anesthesia or specialized training, unlike RFID. RapID Tags are also 100% MRI compatible, unlike RFID transponders. Finally, these tags offer quick, visual identification without scanning or disturbing caged animals. RapID Tags are superior to metal ear tags because they can be accurately scanned in seconds with automated data collection. They are more humane and effective because there are no loops to dislodge and no tissue reactions from contact with metal ions. The multi-colored tags provide millions of unique ID numbers. They also offer quick, visual identification without scanning or disturbing caged animals. RapID Tag’s unique design encapsulates a hardened barcode in a tough, chew-resistant, advanced polymer body. The barcode contains an exclusive combination of alpha-numeric digits providing the lab technician with millions of unique ID numbers. Tags are ordered and shipped in five colors – 20% of each color. Multi-colored ID tags provide ultra-fast visual identification without disturbing caged animals. The automated mouse ear tags can be color-matched to computer-generated labels for cage cards and specimens (see below). RapID Tags come packaged in recyclable trays. This makes them easy to handle and load into the RapID Applicator. This custom hand tool removes a single tag from the tray, then allows for a user to secure the mouse tag to the desired rodent. This process is simple, requiring only a few easy motions. Most individuals can learn it after reading a short description. This streamlines the process, allowing users the ability to tag more animals in less time. Lab tag removal is just as simple. The RapID Removal Tool severs the connection on the female end of the tag. This allows users to remove the tag without causing undue harm to the animal. It's a swift, straightforward, and humane process for tagging mice. RapID Tag barcodes are easily and instantly scanned and read by the ubiquitous Code CR-1400 scanner and other popular hand-held or stand-held ordinary light-scanners. With the CR1400 scanner stand engaged, users can free up a hand to help position the lab tag in direct line of sight for the scanner. When done correctly, the scanner will pick up the ID in less than a second. This rapid response allows users to keep the scanning process moving ahead at a rapid pace. RapID Tag’s industry-standard barcodes have been hardened to resist damage from aggressive, neighboring caged rodents. Getting a ‘ping’ has never been easier while minimizing or eliminating waving the scanner (or rodent) back and forth. To ensure success, the RapID Tags Starter Kit comes with training material. This allows users to practice on simulated animal ears before moving to live ones. Following a series of basic protocols, users can "self-certify," watching for and correcting mistakes as they go. The consecutive trial runs guarantee proficiency at tag application, scanning, and removal before ever touching a live animal. A best practices guide is also included for introducing this new mouse ear tag system to a research laboratory. Following these steps will promote correct training, humane implementation, superior animal identification, and ensure a successful launch. Choose a colored RapID Tag and load it into our specially designed, ergonomic hand-applicator in seconds. Apply the RapID Tag to the rodent’s ear with one hand and one snap in seconds. The RapID Tag data is automatically scanned and collected in seconds.